The world's largest tire recycling plant, operated by Danish company Genan Inc.
HOUSTON—Everything tends to be bigger in Texas. That is particularly true with the world's largest tire recycling plant, which resides in Houston. Texas residents probably don't spend much time considering what happens to the millions of worn-out or busted car and truck tires that are discarded throughout the state each year. But they can leave those thoughts to Genan Inc., the company that operates that recycling facility in Houston to deal with the tires put out of service tires in Texas. The Danish company has found a way to make the tire recycling business profitable by recycling used tires and converting them into raw rubber and steel. Genan has grown its recycling business throughout Europe over the last two decades. It has four plants spread around Europe that each recycles about 7 million tires a year. 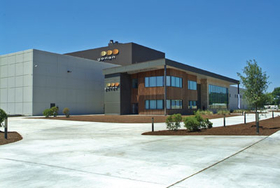 Then in 2011, Genan began to set up tire recycling plants in the U.S. Today the company's American presence includes four sales and distribution locations throughout the country. Back in early May, Genan began managing full production at the northeast Houston plant that sits on 40 acres of land. Constructed over the last two years, the Houston operation will have the capability to recycle about 10 million tires a year—about a third of all the used tires in Texas. It employs 60 workers in a variety of roles, and the company said it expects modest employee growth in the next few years. The Houston plant is serving as Genan's U.S. headquarters, said CEO Thomas Pash in a statement. While new jobs and operations may be added to the facility, it won't be the lone U.S. presence. Pash said that Genan hopes to open at least four new recycling plants in the next few years. Houston was selected for the location as the company's first U.S.-based plant because of the good availability of scrap tire supplies as well as the business friendly environment in the state of Texas, said Lars Raahauge, director of business development for Genan Business & Development A.S. There is the potential for expansion in other parts of the U.S. as well. “We are currently performing due diligence on a number of states across the country,” Raahauge said. The emphasis on tire recycling is based in part on a production method that Genan has developed that allows it to recycle tires in a more efficient way, he said. With tires being comprised mainly of rubber and steel—generally about 90 percent of a tire is made of these two raw materials—the ability to recycle those two items in particular is significant. They can be used in a variety of applications. The steel for example can be sold as scrap to a number of companies worldwide that have a use for such materials. And this production process has allowed Genan to obtain what Raahauge refers to as “near virgin” rubber. “Our products are used for artificial turf installations, playgrounds and recreational facilities, sports tracks and grounds, asphalt roads, building products, flooring, injection molded products, industrial applications and noise insulation,” he said, citing high school and college athletic fields. He said that Genan is a supplier of recycled materials to the rubber industry and does not manufacture finished products. Houston officials have indicated that Genan plans to work with local and state policymakers to encourage more tire recycling as well as the use of more rubberized asphalt in roads.